I think I've identified four ways in which people interact with Galactic Strongholds so far. First, we have the ignorant or disinterested - maybe they haven't really looked into the new features yet and might still change their minds later, but either way they haven't really played around with housing much, if they even bothered to purchase a stronghold at all. The polar opposite of these are the enthusiasts who spend hours decorating their strongholds, trying to get everything just right. 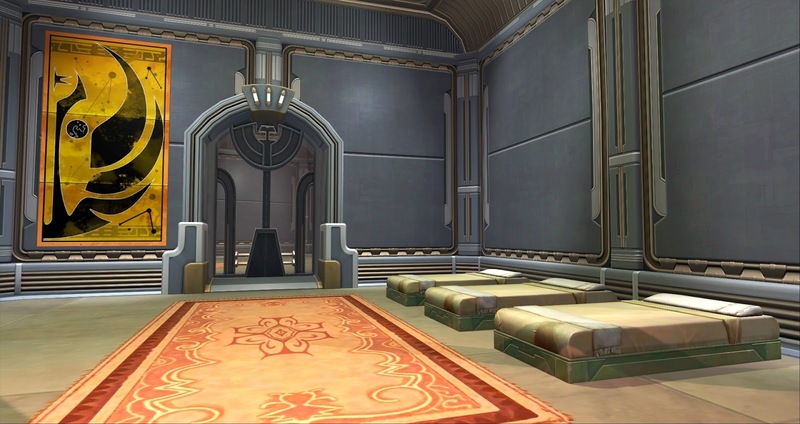 Then there are the min-maxers, who don't really care about housing per se, but they do care about getting a bonus of up to a hundred percent to their conquest point earnings, so they acquire as many rooms as possible and fill them with random crap, usually speeders and boss portraits. And then there are people like me, who are a bit... lost. I do like the idea of housing, but I just can't get myself to knuckle down and make sure my house looks really nice. Every now and then I'll be struck by an idea and purchase one or two items in an attempt to realise it... but I quickly tire of the steps of finding just the right item, finding out where to get it, making sure I have the right reputation and currency to acquire it, travelling to the right vendor, buying the item, going back to my house, adding the item to my inventory, and then finally putting it down. Not to mention that, being a perfectionist, it never quite looks the way I imagined anyway. So I end up with lots of half empty rooms with a couple of items strewn around the place, commemorating my abandoned ideas - but at the same time I absolutely refuse to fill my stronghold randomly just for the sake of conquest points. At least one person has asked me to see my stronghold, and I feel a little ashamed that I don't actually have much to show for my efforts yet. But then I thought: if I'm going to work on this slowly, maybe it's not a bad idea to capture my house at different points in time - that way I can actually see the progress I'm making. 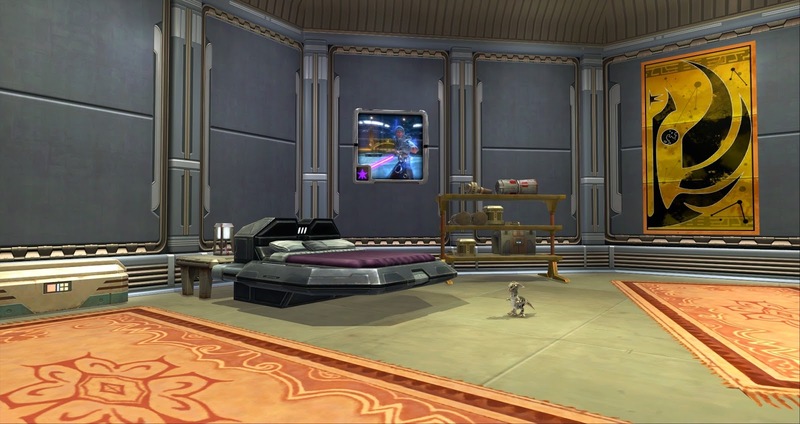 So I decided to take a couple of screenshots of my Coruscant apartment, unimpressive as it is right now. 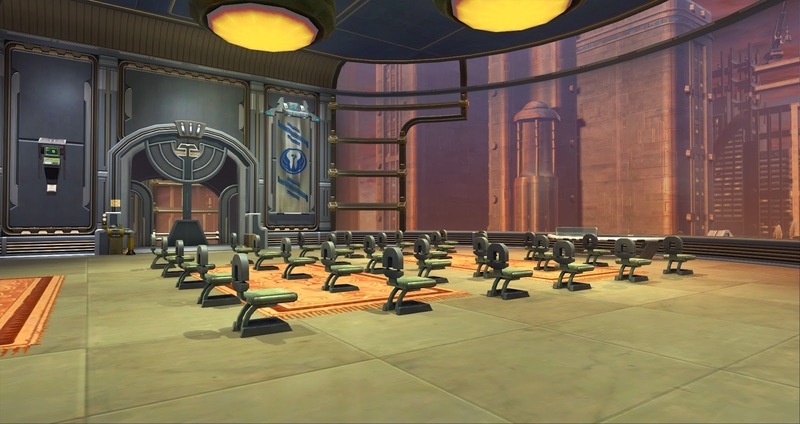 Tatooine and Dromund Kaas are still mostly empty, because why start working on multiple strongholds when I can't even get a single one right? 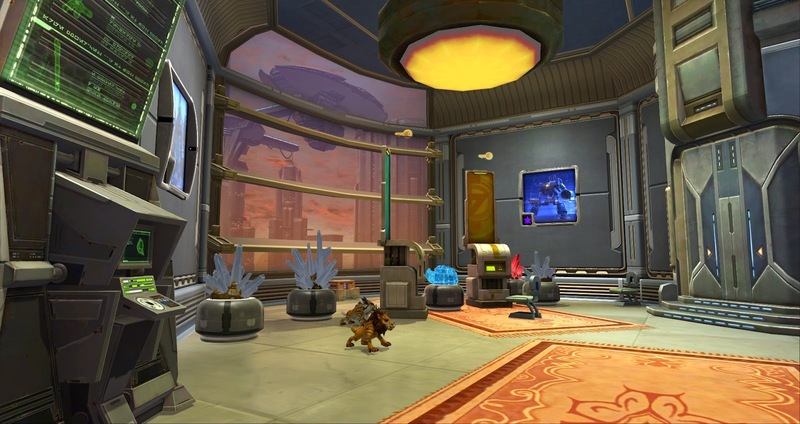 I don't think I've even been to my Nar Shaddaa home yet. I intentionally made the entrance area a bit messy-looking, as I picture my characters coming home after a long day of work, feeling tired, and dropping everything where they stand, and I wanted the environment to reflect that. Thinking practically, I also wanted all the things that were likely to cause me to visit my stronghold, such as the legacy bank or the gathering nodes, to be right there where you load in. I thought I was really clever for thinking of it like that, but from what I've seen from other people's strongholds, a lot of them had the same idea. 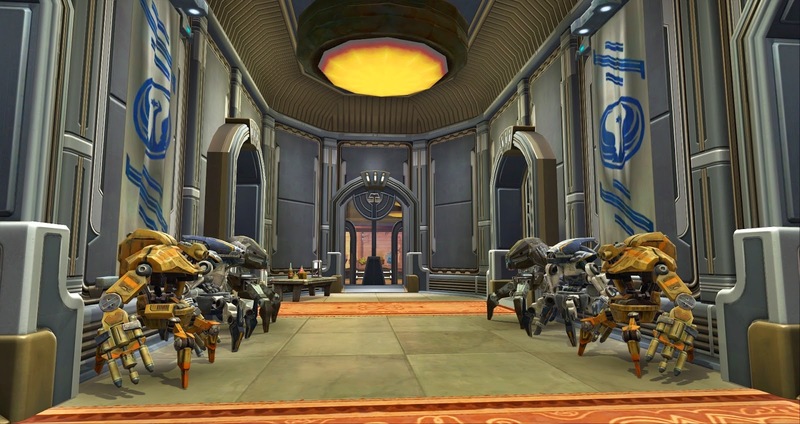 In the main hall we have my killer droid guards. No, they are not vendors, honest. Do you think I may have overdone it a little with the boss pictures here? This is meant to be the main social area. I don't like how rough the tables and couches look and would like to eventually replace them with nicer versions, but for now they'll do. I figure that with all those pictures on the wall, visitors will never run out of things to talk about. The master bedroom is still a bit empty, but I made sure to buy a nice bed as I couldn't stand the thought of whoever of my characters owns this place having to sleep in one of the crappy beds you get for free. Speaking of which, I'm really not sure whose bed this should be. Originally I figured that my trooper main would have her base of operations on Coruscant (patriotism!) 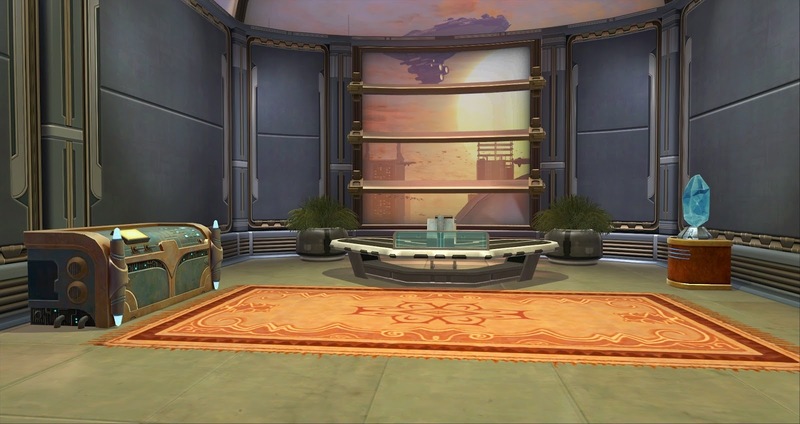 but then I added some rooms that are really more Jedi-like, so I can't decide if the place should officially belong to my Sage or my Guardian. I didn't take any picture of the staircases, the balcony and one of the small upstairs rooms, as those are still very empty except for a couple of lights and potted plants. Directly upstairs we have what I like to think of as the chair spam room meeting room. 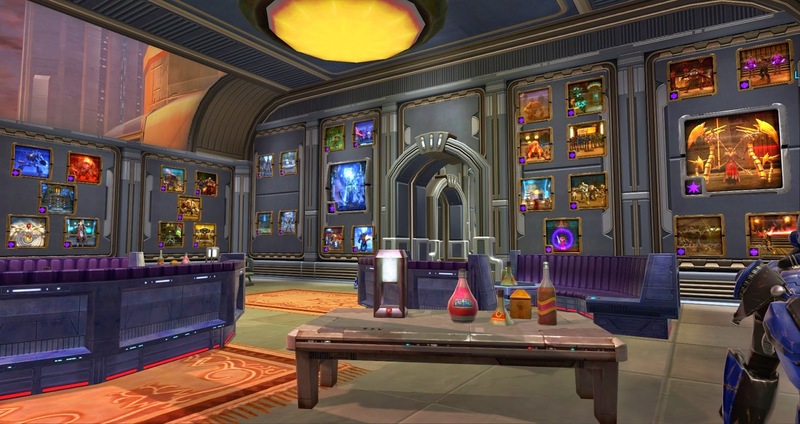 I picture characters from my legacy coming together here with all their companions to discuss the state of the galaxy and other serious matters. At some point while decorating upstairs, I decided that I needed an additional GTN terminal and mailbox, since I didn't want to have to run downstairs every time I bought a new decoration for one of the upstairs rooms. I used a wall terminal because I didn't have any more kiosks left, but I'd like to officially state that I hate the GTN wall terminals - even if you move them as far downwards as possible, they are still positioned so high up on the wall that your characters wouldn't actually be able to reach them. It looks stupid. The other main upstairs room is a sort of Jedi study... thing, possibly doubling as a meditation/relaxation area. Mostly I want to fill it with datacron decorations. 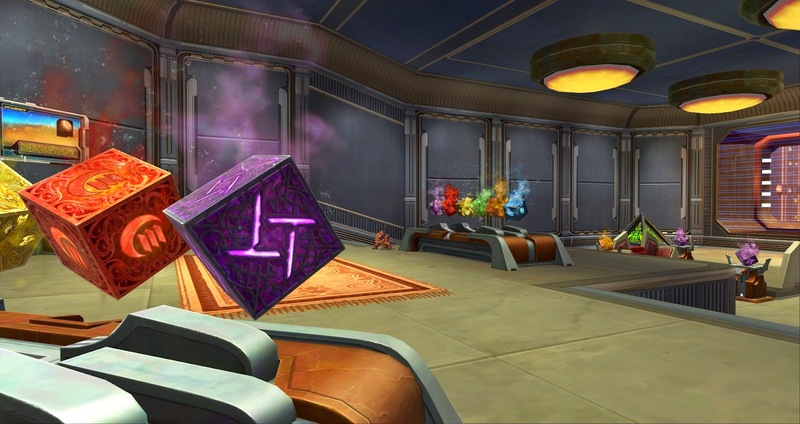 See that Holocron of Fear at the back there? I won that in Dread Fortress the other night, yay! For more focused solitary studies and work, there's a small office type room. Finally, I've turned two of the smaller rooms into guest rooms where I used the crappy free beds. They kind make the place look like some sort of refugee shelter more than a proper guest room though, so I'll probably want to replace them too at some point. Now, if you want to see some actually finished and nice-looking homes, I recommend checking out the customised strongholds on TOR Decorating. Most of the submissions there demonstrate some seriously impressive decorating skills. I took two approaches to adding decor. 1) One room at a time, starting front and moving back. 2) Whatever's cheap. If it looked cool, and was cheap, I bought it and stuck it in an unfinished room in the back. As I finished each room, I reorganized and took/replaced items as needed. That's my deco-tip! For the GTN wall terminal, change the layout to get a medium blue square thing. Then the terminal will move to rest on the floor. Thanks for the tip with the GTN wall terminal! Sadly that Coruscant wall is so high that the terminal remains way too high up even with the medium layout (though at least it's a little bit further down). On Tatooine that strategy worked beautifully though. If you shift the x or y (I forget which one) you can get the GTN wall terminal pretty close to the ground if its on the bottom of the two medium wall hook layout. I am working on my strongholds room by room as I just don't have enough stuff to do it all as I would like straight way. It means like you some rooms are very empty or placeholders until I get the decorations that I want... That and I keep changing my mind. Thanks - Traitine above gave me the same tip in regards to the GTN wall terminal. It works like a charm on Tatooine, but sadly the walls in that Coruscant room are so high that it still floats above my characters heads' even with that setup (though slightly less so). I would never make an interior decorator. I think I've got that Lucky-77 swoop at the landing platform, one or two items up on walls, and that's it. Really, for me, a bed and a couch are all I need. My toons live on their ships, and while I love the idea of housing, I'm just kind of nonplussed at what I can put in place.